The weather is warming up and one of my favorite seasons is beginning: Garage Sale Season. I love a good bargain, and with three growing boys, I need to find good bargains – especially on clothing. Garage sales are great places to find affordable, quality kids’ clothing, toys, home decor, furniture and craft materials. It’s easy to get caught up in the thrill of the hunt and lose sight of your savings mission. 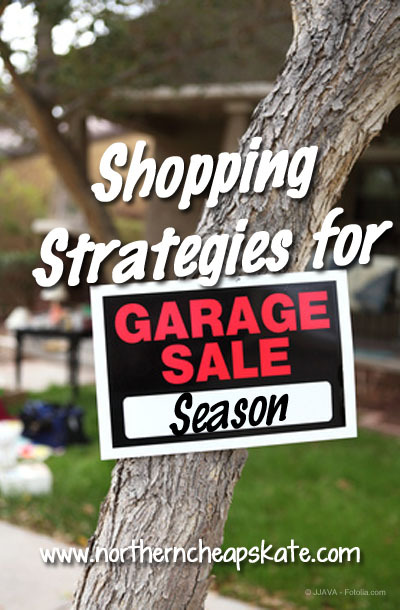 So I’ve compiled this list of tips for making the most of your garage sale shopping. First of all, know your inventory. Go through your closets and take note of what things you already have. Pay attention to the sizes, styles, condition, and seasons of all your clothing. Make a list of the items you will need. Once you have the inventory done, you’ll have a clear idea of things to keep an eye out for at sales. For example, I know that I should be looking for snowpants for the boys for next winter, and pajamas for this fall. I’m well stocked on summer stuff, but could use a few more jeans and sweatshirts for next winter. I also keep an eye open for Halloween costumes for the kids and one-of-kind gifts for family members. Know your prices. I’m usually willing to a pay a little bit more for children’s clothing if it’s in great shape and is a name brand (such as Old Navy, Levi’s, etc.) than I am for discount store brands. I recently saw a kid’s shirt that looked somewhat worn for $1 that came from JCPenney. I know that if I really watch the sales, I could get a similar shirt, brand new at JCPenney for $2 on clearance. I’d rather have a brand new shirt for just a little bit more money. It’s important to know what the item would cost you new so that you know if it is a decent price at a garage sale. Be ready to bargain. Many people are willing to bargain with you, so don’t be afraid to ask for a deal. Sometimes the person won’t deal, but most of the time, they just want to get rid of the stuff. Set a budget. It’s very easy to get caught up in all the good deals at a sale, so set a budget before you leave, and don’t exceed it. Raid your change jar, search the couch cushions, sell some aluminum cans, or even hold your own garage sale, to help raise funds for your shopping excursions. Map out your trip. I like to plan out my trips so that I can make the most efficient use of my time and gas money. To save even more money, bring your own refreshments so you’re not tempted to hit the drive-thru while you’re out and about. Many newspapers will even post their garage sale ads on their websites, so you don’t have to buy a paper. Just jot down the information you need, map out your trip, and go. Try to shop alone. Bringing kids or spouses with you can slow you down and cost you more money than you’ll save. Impatient and reluctant shoppers have their ways of distracting you from finding the best deals. Don’t buy things that you know are stained, missing parts or broken. You always say you can fix it, but you won’t. Remember this: The early bird gets the worm… and good things come to those who wait. The best selection is always at the beginning of a sale… but the best deals always come at the end. One time I got a laundry basket and a new soccer ball for FREE at the end of a garage sale simply because the homeowner was moving and didn’t want to deal with her unsold stuff. Get to know who has the best sales. Many people have high-quality sales on a regular basis. One woman I know even sends out e-mails to frequent customers alerting them to her upcoming sales. When you get to know the best sales, you can make better use of your time and money. Think before you buy. Sometimes I will pick up an item and think it’s a must-buy. But after carrying it around for awhile, I may re-think the purchase. I may notice a flaw in it, or I may decide I don’t really need the item. I might also decide I don’t want to clean it, store it, or maintain it. It’s important to think about your potential purchases no matter how big or small. Remember this: A deal is only a deal if it is something of value that you need or want and can afford. Otherwise, it’s just clutter that will end up in your next garage sale. Great article! I love scouting out the sales on Craigslist the night before. I especially love it when sellers post pictures and clothing sizes. I too like to look for the “freebies” or even ask if the seller will “throw something in” with a sale. usually do better looking at the non in- demand items…one of a kind,,,…odds and ends. always keeping in mind other friends or family who “could use this” if it is not too expensive. Chit chatting with the seller often results in better deals. My 25 ct bargain history has included: clay plant pots, nail polish, sweaters and jeans…all like new…..amazing. I LOVE garage sale season! One thing I do is keep my kids’ money from birthdays and Christmas (they are still toddlers) in separate envelopes. Then when they need something, I use that money to buy things and it doesn’t come out of our budget. I recently bought 11 dresses, two pairs of pjs, three shirts, a pair of pants and five pairs of shorts for $6 at a garage sale! I was ecstatic. It is definitely the best way I’ve found to save money on clothing. Great tips!